The network news divisions boast about how much they care about the truth, and rage against President Trump when he calls them makers of “fake news.” But when it comes to the politicians they adore, especially those they wish would run for president, the truth takes a back seat. Exhibit A right now is Elizabeth Warren, who falsely claimed in professional directories to be descended from Cherokee Indians. As the Media Research Center's Brent Bozell noted Thursday morning, a Wednesday evening New York Times editorial which made it into Thursday's print edition outrageously perpetuated "a long-debunked leftist conspiracy theory about Gov. Sarah Palin inciting the (2011 Gabby) Giffords shooting," even though the paper's "own news reporters declared just yesterday that there was no evidence linking Palin to." The Times issued corrections which would have led its readers to believe that all mention of the 2011 Palin-targeting myth had been excised. That's not what happened. The latest scorecard from the American Conservative Union is out, and the voters of Virginia might want to file a complaint about truth in advertising with the press corps. Senators Tim Kaine and Mark Warner have routinely been portrayed in news reports as “moderates” and “centrists.” But after two years in the Senate, Tim Kaine has a perfect zero on the conservative scale. Mark Warner has a lifetime score of 10.33 percent conservative, but his last two annual scores have been a 4 and an 8. They could be mistaken for Barbara Mikulski (lifetime rating of 5.1). On Sunday night, ABC’s Barbara Walters hosted her annual 10 Most Fascinating People program which featured billionaire businessman and conservative donor David Koch as one of the “most fascinating people of 2014.” A preview of the interview aired during Sunday morning’s This Week with George Stephanopoulos portraying Koch as “one of the biggest Republican donors, a reclusive billionaire, David Koch. Democrats love to hate him.” During the full interview, Walters expanded on the liberal attacks against Koch but also detailed the hundreds of millions of dollars he has donated to philanthropic causes over the last several decades. Did Chuck Todd Say Too Much About MSNBC? Barack Obama's reaction to Tuesday's big election loss for the Democrats was mocked at the Country Music Awards by Carrie Underwood and Brad Paisley. If their act looks somewhat familiar, they were the same duo who mocked ObamaCare last year at the same show. Politico has noticed a lack of women in statewide office in Iowa for over 20 years. So who is promoted as the possible savior of this situation? Not the obvious choice. Instead it is promoting Hillary Clinton who is might be running to win the Iowa primary for presidential nomination, not statewide office. Judging from reports carried by the three mainstream networks' news programs and most of the low-rated cable news channels, it seems that the Fox News Channel and conservative Republicans are totally consumed by the concept of impeaching Democratic President Barack Obama. However, a Lexis-Nexis search of transcripts from the July programs on FNC and MSNBC indicated that for every mention of the words “impeachment” or “impeach” on the “Fair and Balanced” channel, the “Lean Forward” network used those words five times. On Friday, NPR political director Ron Elving asked in an online article “Is The Tea Party Finished?” Then he answered: “Yes, if you insist on calling it the Tea Party. Because that phrase implies the phenomenon is some sort of organized unit in the usual sense. And the Tea Party never really was one.” You might be able to read some delight between the lines, since the Tea Party wanted to defund public broadcasting. 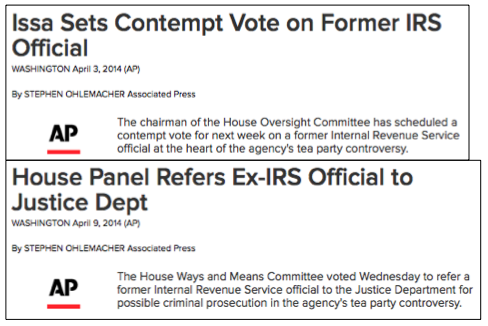 Once again, as it did a month ago in two separate stories, the Associated Press, aka the Administration's Press, left the name of Lois Lerner, the former IRS official who ran its section on tax-exempt organizations, out of its headline and opening paragraph. This time, for good measure, AP reporter Stephen Ohlemacher didn't reveal Lerner's name until Paragraph 3. Before getting to Ohlemacher's journalistic malpractice, let's take a look at the how the Politico handled the same story of Congress holding Ms. Lerner in contempt yesterday, and at one example of how the AP itself covered the story of another controversial figure's anticipated congressional appearance in the 1980s. Liberal Washington Post columnist Dana Milbank did his best to spin the extramarital affair of Congressman Vance McAllister (R-La.) by declaring “Republicans make their ‘war on women’ worse.” In a piece published April 8, Milbank professed that the McAllister affair was “Not the way Republican leaders had planned to observe Equal Pay Day” before laying into the GOP’s supposed problems with female voters. After spending three paragraphs detailing the affair itself, the Post columnist asserted that “Republicans aren’t responsible for McAllister any more than Democrats are to blame for Anthony Weiner’s weirdness. But for Republicans, who have a big disadvantage among unmarried women, this reinforces a perception.